Won’t you be my neighbor, Kyrie Irving? How about you, Paul George and Isaiah Thomas? Would you be mine? Could you be mine? Those three big-time ballers, plus seven more NBA stars, pop up around an otherwise typical city neighborhood in CP+B L.A.’s fun launch film for the latest version of NBA 2K, which drops Sept. 19. The spot promotes the 2K Sports franchise’s new “Open World” feature, which lets gamers explore different aspects of the broader basketball experience, including visiting various local haunts. “We needed a vehicle or guide to get us through the neighborhood, so we liked the idea of a kid walking from his apartment to go play basketball on a sun-drenched afternoon, meeting all the regulars on his way, and greeting them like you would the locals of your own neighborhood,” Blackburn says. Anesu Mutara’s chill performance—strolling through South Central Los Angeles and Long Beach during a two-day shoot in June—provides a relatable focus in the midst of the celebrity full-court press. This marks another notable marketing push for the NBA 2K franchise from CP+B, following its work for NBA 2K17, which featured a Fitbit tie-in encouraging gamers to get more exercise IRL. That work was honored this week by Adweek’s Project Isaac Awards as one of the most innovative campaigns of the past year. As for NBA 2K18, director Stacy Wall of Imperial Woodpecker has walked similar streets before. 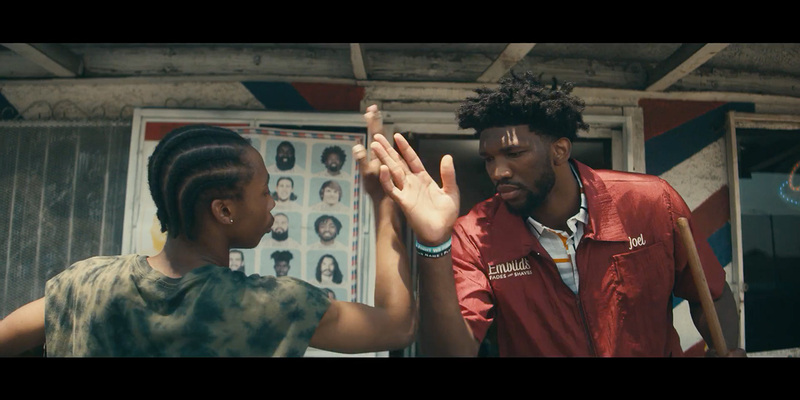 He helmed Nike’s acclaimed “Short a Guy” spot from 2015, which followed an average kid who spends a magical day interacting with his heroes from various pro sports teams. Though the set-ups in the two ads are pretty much the same, the vibes are quite different. “Short a Guy” has a quick-cut, fantastical feel—like a fan’s frenetic fever dream come true. And at times it’s played for laughs. (Pick-up lacrosse? Really?) NBA 2K18’s “Run the Neighborhood,” despite its impressive star power, casts a subtler, more personal aura. Wall’s deliberate pacing and dense visual palate impressively integrate the hoop legends into a slightly skewed version of everyday reality. Also, there’s a muted, retro ambiance (the record store is one example) that adds an extra layer of emotional resonance.